Apologies to most of my readers, but this article is specific to San Francisco. For decades, I believe, this city has had a separate network of hydrants for drinkable water, in addition to the fire hydrants. 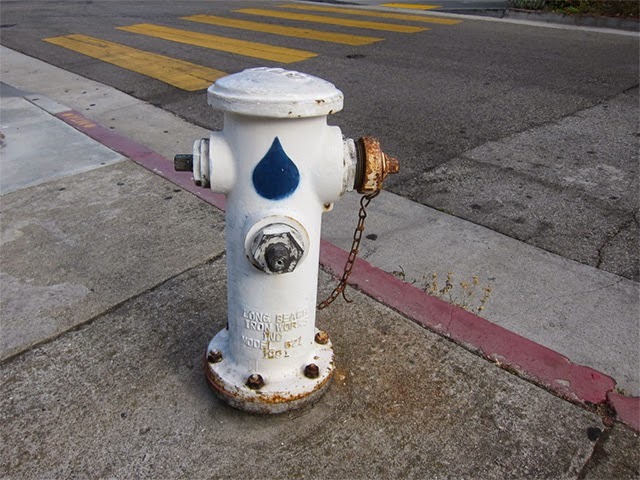 There are about 65 of these hydrants, identifiable by their blue drop logo, spread throughout the city, with the idea that if water supplies were disrupted and people didn’t have enough emergency water stored, they could go to these emergency potable water hydrants and fill up. That’s a nice idea, but getting information about these theoretical hydrants in the last few years has been like trying to locate unicorns. We keep hearing about this program, but official information has been next to non-existent. There was one source for a while, drop2drink.org, that provided a map of the hydrants, but a few years ago, that site mysteriously turned into a Thai wedding site! (And some emergency info resources still link to that!) To make matters worse, when I looked around the vicinity of where our closest hydrant was supposed to be, I didn’t see anything obvious. I thought we had a breakthrough just a few weeks ago when I learned through SFist.com about a new interactive map that had shown up on Foursquare that was really pretty comprehensive. It even had photos of some of the hydrants like the one at the top of this article, so I really thought we were getting somewhere. So, imagine my surprise today when I revisited SFist and found a new article in which they had interviewed San Francisco Public Utilities Commission (PUC) emergency planning director Mary Ellen Carroll, who called the program out of date and said that the water in the hydrants should NOT be used after an emergency unless the PUC certifies it as ok, with no guarantee that it would turn out to be ok. In fact, the article quoted Public Outreach director Amy Sinclair as saying that there's "no way should ANYONE be opening these hydrants except the Fire or Water Departments.” Ms. Carroll went on to say that “We've been working over the last three years to develop a different plan and to walk away from the blue-dot hydrants for the moment.” The whole article can be seen here. Well, I guess if you are being wise and saving emergency water in your home (official recommendation of 1 gallon per person per day for 7 days), you hopefully won’t be missing those hydrants (and if you don’t live or work in San Francisco, you would not have cared about them anyway). Remember that as I reported last year, the FDA says that unopened commercially-bottled water jugs can be stored indefinitely, and that the “use by” date printed on the jugs is really a best-by date rather than an expiration date. As for the legendary SF emergency drinking water hydrant program, it sounds like the legend is about all that’s left.